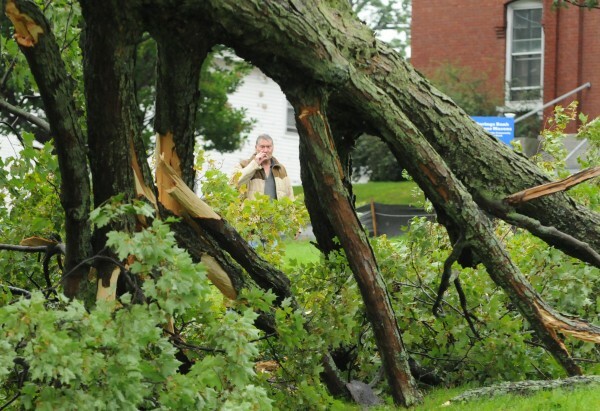 A man smokes a cigarette while inspecting a tree that was topled by high winds from hurricane Irene along Union Street in Bangor on Sunday, August 28, 2011. Bangor Hydro lineman Dan Anxien trips a breaker on a transformer on Vine Street in Bangor to restore power as neighbors watch on Sunday August 28, 2011. 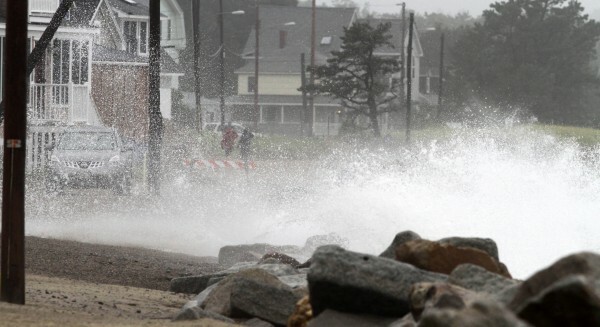 Waves crash across the road in Saco as Tropical Storm Irene makes its way into Maine on Sunday, Aug. 28, 2011. Irene caused more than 4.5 million homes and businesses along the East Coast to reportedly lose power over the weekend, and at least 11 deaths were blamed on the storm. Waves crash across the jetty as Alex Brown of Saco and his son watch the storm in Saco as Tropical Strom Irene makes its way into the state on Sunday, Aug. 28, 2011. Irene caused more than 4.5 million homes and businesses along the East Coast to reportedly lose power over the weekend, and at least 11 deaths were blamed on the storm. PORTLAND, Maine — Downgraded from hurricane to tropical storm by the time it reached Maine, Irene proved weaker than most forecasters anticipated but still pummeled the state Sunday with high winds and heavy rain. By late evening, the storm’s winds topped 50 mph in some areas, causing nearly 185,000 power outages in central and southern Maine. Power interruptions topped only about 29,000 in eastern and northern Maine by 9 p.m., but that number was increasing throughout the evening, with a large-scale outage affecting the majority of Brewer and Hampden. In addition to outages, flooding was a primary concern as rain continued to fall on Sunday. In western Maine, a bridge on the access road to Sugarloaf USA had washed out entirely. Northern Oxford County was the heaviest hit with an estimated 8 inches of rainfall. Most other areas had totals in the 2-4 inch range, although some parts of Maine saw even less. Indeed, in many areas of Maine, Irene was a lot of big wind, downed power lines and outages and not much else. David Lloyd, public works director for the Town of Lincoln, said late Sunday that his crews hadn’t received a single call, which he found ironic given the extensive precautions. In reality, the effects of the storm were widespread, even if they were lessened, and were expected to continue into Monday. Trees and power lines fell throughout Maine, roads closed due to standing water and astronomical high tides led to breaking waves that caused damage along the coast. Maureen Hastings, a forecaster with the National Weather Service in Caribou, predicted that when high tide occurred late Sunday evening, the Penobscot River around Bangor would be at a high risk for flooding. A check of the river and Kenduskeag Stream in Bangor at 11:15 p.m. revealed high water but no apparent flooding. While the rain ended earlier than expected Sunday afternoon in southern Maine, the Maine Emergency Management Agency issued a reminder that the storm was not over and dangerous conditions could last into Monday, especially near the coast where the surf could remain high. High tide late Sunday night was also seen as a flood threat along parts of the coast, and Acadia National Park planned to close a section of its Park Loop Road overnight. 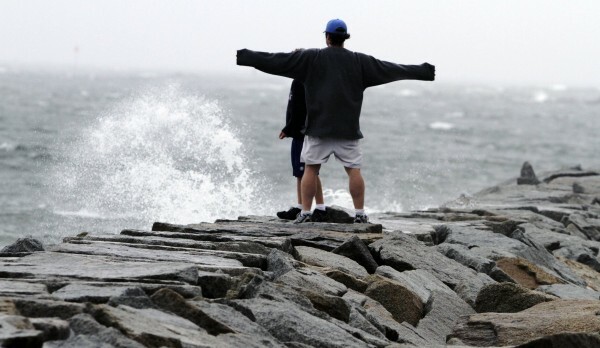 Mainers were on high alert long before Irene arrived. Gov. Paul LePage declared a state of emergency on Friday and on Saturday, he and Maine Emergency Management Agency Director Robert McAleer urged Mainers to exercise caution. Penobscot County Emergency Management Agency Director Tom Roberston said his agency was prepared for the worst but was pleasantly surprised with the limited amount of damage. “I think we’ll lose some trees and some power, but thankfully nothing like New York, where 8.5 million people are without power,” he said. Although Maine was not among the many East Coast states to order residents in some areas to evacuate, dozens of communities opened emergency shelters across Maine. Mainers can find a shelter in their area by dialing the state’s 211 information hot line. The City of Portland’s shelter at the Portland Expo building housed 16 people Saturday night and members the city’s support team traveled to known camping sites to connect with the city’s homeless population. While shelters and evacuation plans were established and drawn up in most areas, there appeared to be no need for them in greater Bangor, Robertson said. Power outages were undoubtedly the biggest inconvenience. Most of the interruptions reported Sunday by Central Maine Power Co. were in Cumberland, York and Kennebec counties. CMP’s 9 p.m. report indicated they had about 182,000 customers without power, with 7,769 in Sagadahoc County, 5,835 in Waldo County, 5,984 in Penobscot, 6,363 in Lincoln County, 1,421 in Knox County, 7,160 in Somerset County, 2,095 in Hancock County, 477 in Piscataquis County, 29,704 in Kennebec County and more than 78,000 in York and Cumberland counties, and others in western Maine. 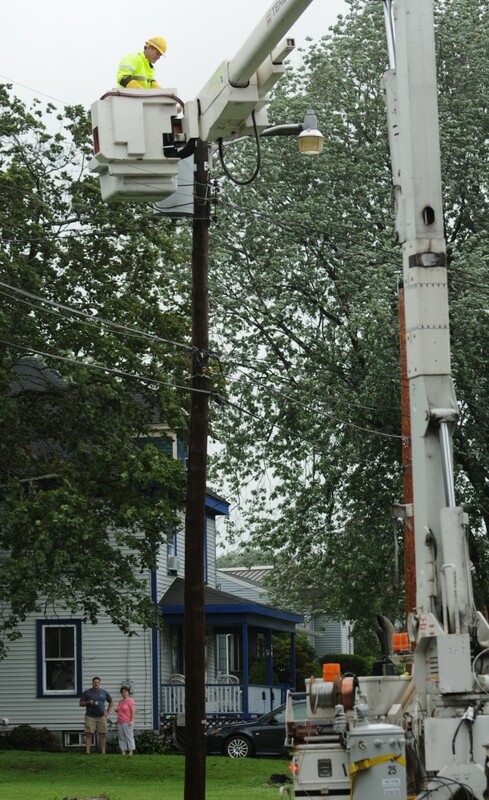 A spokesman predicted it could be several days before power is restored to all customers since about a quarter of all CMP customers were affected. Bangor Hydro-Electric Co. reported about 29,000 customers without service by 9 p.m., with 16,519 in Penobscot County, 10,902 in Hancock County, 137 in Washington County and 2077 in Lincoln and Piscataquis counties. As power outages increased throughout Maine on Sunday, state officials urged residents to be careful using gas-powered generators because of the risk of carbon monoxide poisoning. In most cases, Mainers seemed to be well-prepared for the storm. On Saturday, hardware and grocery stores were filled with residents stocking up on essentials. On Sunday, residents turned to spectators. In the Camp Ellis section of Saco, windblown surf splashed against homes a mere 10 yards from the seawall as Cambridge, Mass.-resident Joey Said battled the elements to reinforce plywood window coverings on a house where he was vacationing. “We got a front-row view,” he said. In Old Orchard Beach, neon No Vacancy signs gleamed through the rain and all of the amusements were shut down. On the beach, folk-blues singer Anni Clark strolled along to take in the sight. “I like to witness Mother Nature at her best and worst. Mother Nature is doing a big old dance and I want to dance with her,” said Clark. Former President George H.W. Bush and his wife, Barbara, planned to stay at their summer home in Kennebunkport to ride out the storm — unless they are asked to leave. Even if people had wanted to leave, most travel options were halted Sunday. Officials at both Bangor International Airport and Portland International Jetport said their facilities would remain open but most flights were expected to be canceled. Maine’s Downeaster passenger rail service canceled all service Sunday and officials there said it was possible service would be canceled Monday as well. Maine State Ferry Service based out of Rockland was considering whether to cancel service to the islands, but had not yet made a decision as of noontime, according to an agent there. A ferry to Vinalhaven that was scheduled to depart Rockland at 1 p.m. was being dispatched at around noontime. In Brunswick, organizers of the Great State of Maine Air Show and Business Aviation Expo, which began Friday, canceled the show that was scheduled for Sunday. Similarly in Bangor, American Folk Festival organizers canceled all events Sunday. Students in several school districts that were due to start Monday were told they were getting an extra day of summer vacation. Not everyone was boarding up business. Some used their Yankee ingenuity to turn a buck and have a bit of fun at the expense of the heavily hyped storm. Papa J’s and the Lobster Bar in Belfast, usually closed Sundays, planned to open for a few hours for a hurricane party, said owner Vernon Baker. “It’s an excuse to make pretty pink drinks and play some Zimba music,” said Baker. The Maine Democratic Party was going ahead with its Muskie Lobster Bake in Freeport, and moved the event indoors while billing Sunday’s event as the Muskie 2011 Hurricane Party. BDN reporters Eric Russell, Christopher Cousins, Andrew Neff, Nick Sambdies Jr. and The Associated Press contributed to this report.